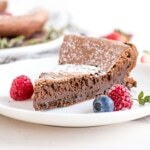 This flourless chocolate espresso cake with a crispy top crust and a rich fudgey interior is a chocolate lover’s dream! What a week! It all started with a sore throat on the 4th. What I thought was a minor cold that would last a couple days turned into a relentless ongoing cough that has taken over my life. The typical cold symptoms subsided after a day or two, but then the cough started. A constant tickle in my throat that gets so bad I’m sometimes left gasping for air. No joke. Needless to say, this has been a pretty sleepless week. No amount of over the counter medication has helped, not even a little bit! Buckleys, Benylin, Sucrets, Ricola… I could go on and on. It’s like we’re running our own little private pharmacy over here, with my frustration growing more and more each day. I do NOT get sick. I am so careful about using hand sanitizers, wiping things down, staying way from sick people (as much as I can) and taking preventative vitamins if I feel something coming on. I’m a bit of a germaphobe and it honestly enrages me if people are out and about when they’re sick — coughing without covering their mouths, sneezing all over the place. RAGE. Total disregard for others, and it happens way too often. Ugh, can you tell this cold has me mega-grumpy? By some miracle, I managed to get in to see my family doctor on Friday. Usually it’s a 3 week wait to get in to see her, but I managed to piggy back on an appointment that Ryan had with her in the afternoon. I happened to have a major coughing fit right in her office, and when she saw me she ran to get a face mask and put it on, lol. I can imagine how disgusting I must have looked/sounded. She prescribed cough syrup and a painkiller, since by this point my ribs were hurting from all the coughing. Would you believe we had to go to 3 (!!!) different pharmacies to get the cough syrup?! Everyone was out, and I was slowly breaking into a panic that we wouldn’t be able to find any. Third time was a charm. My cough is “better” today, but not gone. I am relieved to have gotten a good night’s sleep finally though! 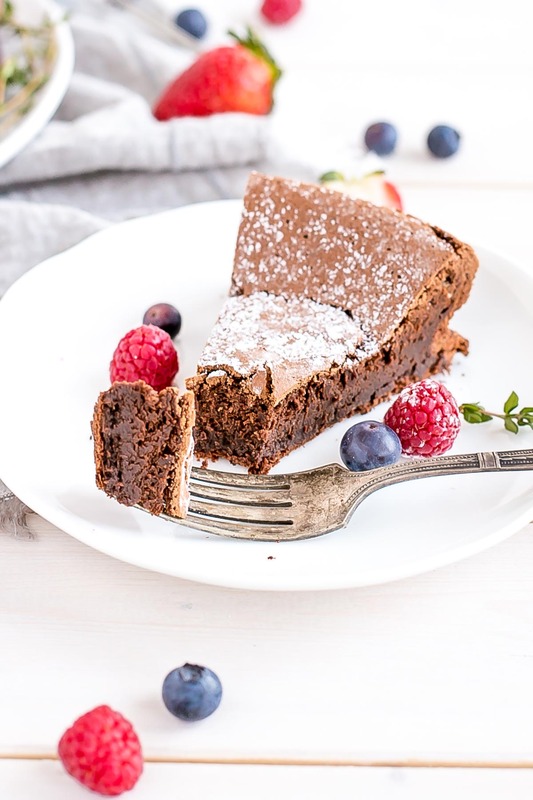 Ok, enough whining about my cold, on to this Flourless Chocolate Espresso Cake! This is my second time making a flourless chocolate cake — the first time was in Pastry School a couple years ago with my friend Lindsay for our final project. The one we made was more of a chocolate paté and didn’t have a crunchy crust like this one, but it was every bit as delicious. 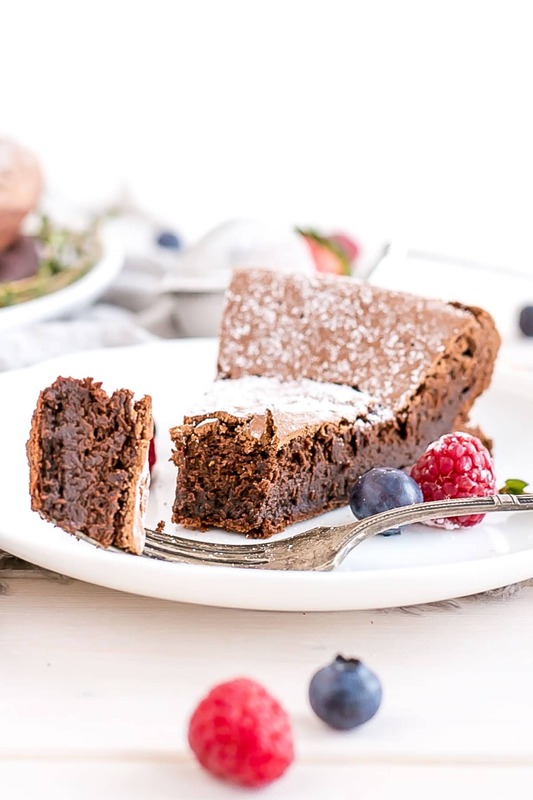 There are a variety of ways to make a flourless chocolate cake. Some call for whipping the yolks and eggs separately, some call for no whipping at all, and some (like this one) call for whipping the whites only. There is no right or wrong way, though it will affect the texture of your end product. All are equally delicious. 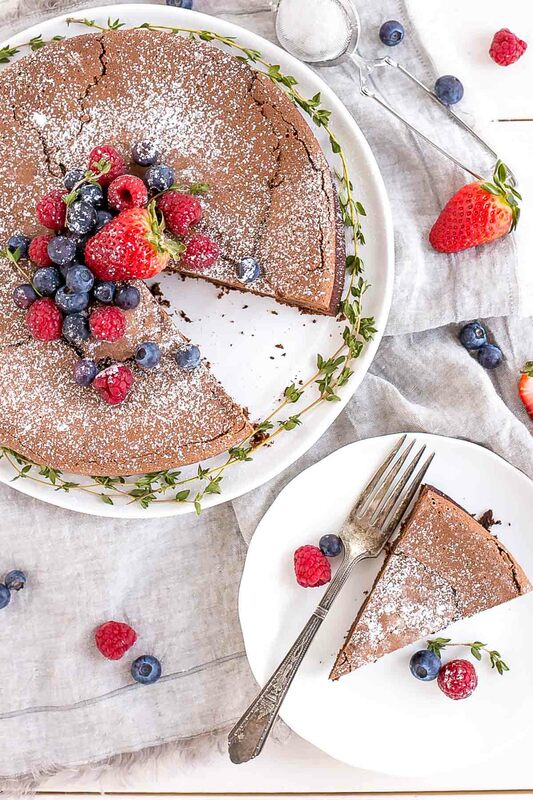 This flourless chocolate espresso cake consists of few simple ingredients — chocolate, butter, eggs, sugar — and is relatively easy to make. The most challenging part is probably chopping all of the chocolate! I hate chopping chocolate, maybe even more than making pie crust (not really, but it’s close), so if you have any tips on how to quickly/easily chop chocolate, I would love to hear them!! I chose to flavour this flourless chocolate cake with espresso, but you could leave that out or try a variety of other flavour combinations. The espresso really enhances the chocolate flavour and you know I love coffee with chocolate in desserts. 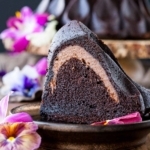 This Flourless Chocolate Espresso Cake has a very intense chocolate flavour. It’s not overly sweet, so if you’d prefer something sweeter opt for a 50% or 60% dark chocolate (mine was 70%), or add a bit more sugar. 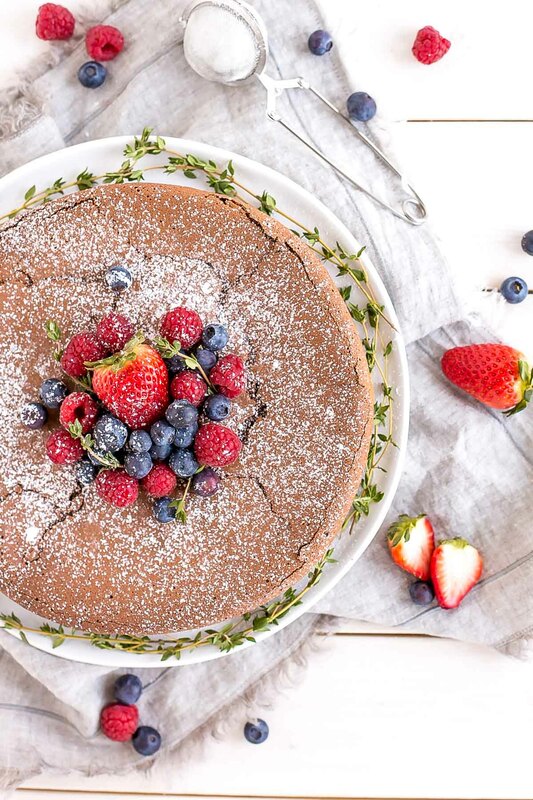 Being flourless, it is completely gluten-free, so it is a great dessert for people with dietary restrictions. 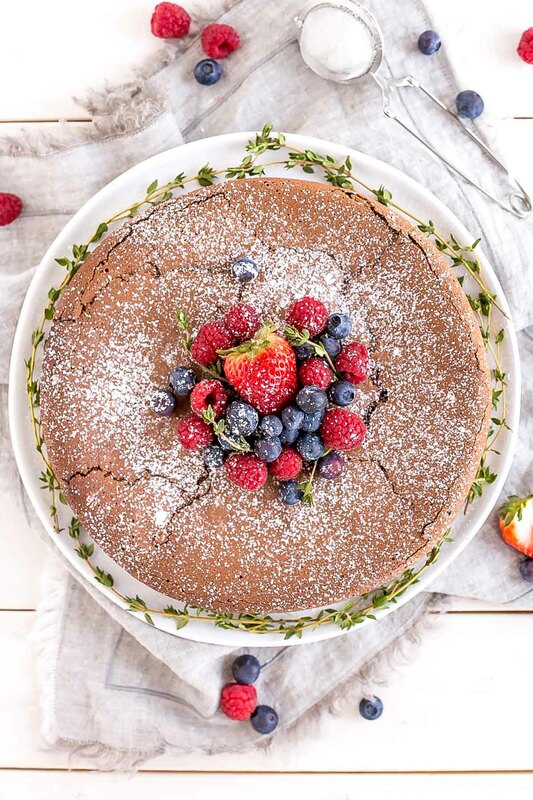 I chose to top mine with a simple dusting of powdered sugar, but you could dust with cocoa powder instead, or serve with whipped cream or ice cream. 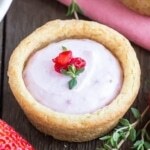 Raspberry or caramel sauce would be a delicious compliment to it as well! Don’t overwhip the egg whites or they will be difficult to fold in. It’s ok if there are some white streaks of egg whites left, you don’t want to fold too much and risk deflating it. 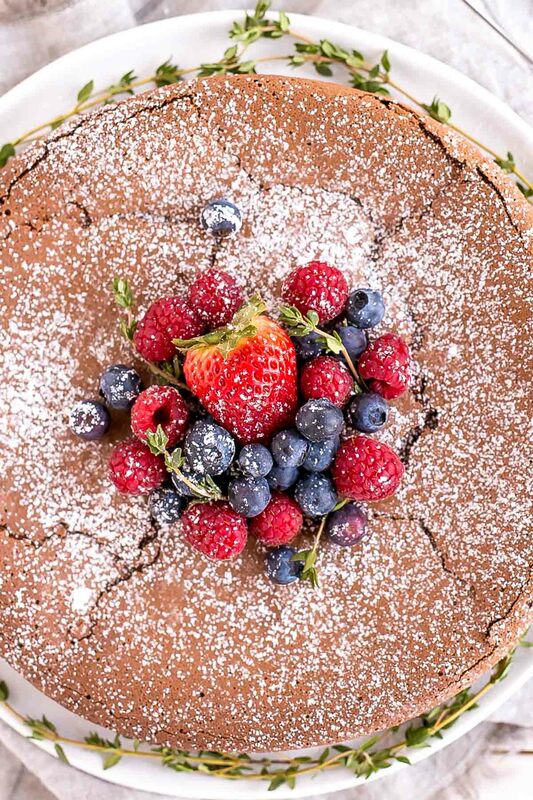 You can skip the espresso powder if you’d prefer just a chocolate cake. Alternate serving options are drizzled with caramel or fruit syrups. 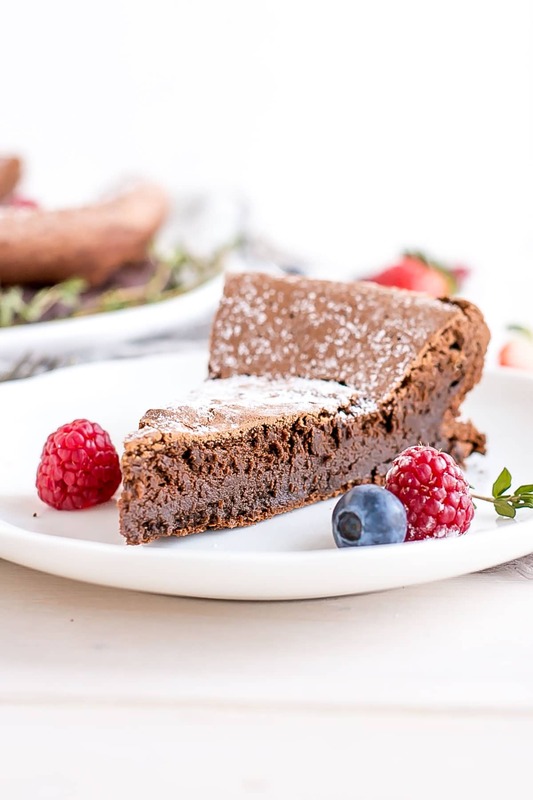 This flourless chocolate espresso cake with a crispy top crust and a rich and fudgey interior is a chocolate lovers dream! Preheat oven to 350F. Butter the sides and bottom of a 9" springform pan and dust with cocoa powder. Place chocolate and butter into a large heatproof bowl. Place bowl over a simmering pot of water to create a double boiler. Melt until smooth and combined. * Cool slightly and whisk in egg yolks and espresso powder. While chocolate is cooling, start whipping the egg whites in a grease free bowl. Just before they reach soft peaks, start adding the sugar 1 Tbsp at a time. Beat until almost at stiff peaks and glossy. Spread evenly into prepared pan and smooth the top. Cake should pull away from sides of the pan as it cools, but run a knife around the edges if needed and remove the sides of the pan. * You can also melt it in the microwave. ** It's ok if there are some streaks of whites. *** Cake is easiest to cut when it is chilled. Cut slices about an hour before serving. Hi Liv, I’m so in looove with your blog. Could read for days… I read that a sugar substitute wont work. Have you tried monkfruit (lakanto brand) or ever heard of it? Hi Briseida! Thank you for your sweet comment!! Hmmm, I’m really not sure :\ I have heard of monkfruit but haven’t used it. Are you looking for something sugar free? 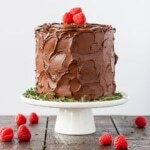 This cake looks great, I can’t wait to make it this weekend! Is there a sugar substitute you could recommend that wouldn’t affect the taste or texture too much? Hi Alexis! I’m not sure a substitute would work as the sugar has to be incorporated into the egg whites to create a meringue. 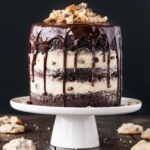 Delicious cake. I noticed it was similar to the Martha Stewart recipe and modified with the espresso powder/baking time. It came out perfectly! The only thing I would add would be a pinch of salt and vanilla– but that is just from baking habit! 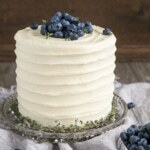 Very tasty and light cake; will be making again! I don’t have espresso powder and i don’t think my local waitrose sells it (i live in the UK) so unsure where i can get this from. Can i substitute it with normal instant coffee granules? Hi Kimberley! I worry that instant coffee granules wouldn’t dissolve completely, but can’t be certain. I would try and mix them up with the egg yolks to see if they dissolve ok before mixing with everything else. Alternatively, you could just leave the espresso powder out! Hi Liv, I made this cake for my husbands birthday last night and it was a hit! 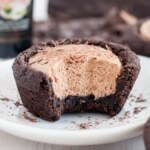 The texture was amazing – so light yet fudge in the middle! The raw batter was so light and airy. Fabulous recipe I will be making this one again! Hi Jayne! I’m so glad you guys liked it! I’m not 100% sure what Espresso “powder”is? Help! I’m so sorry you’re sick. I hope you’ll feel better soon. 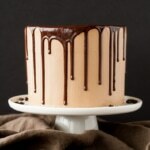 This cake looks absolutely delicious. Would this work well if prepared/baked the day before then chilled overnight in the fridge? What would you recommend. Hi Rachel! For sure, that would work great. Just be sure to let the cake or slices come to room temperature before serving. Oh no, I’m sorry your sick! I hope this doesn’t foretell my future-I started with a sore throat and aches yesterday and then I’ve had small little urges to cough today. 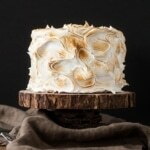 This is a cake I can definitely manage and I love the espresso addition! I understand your whining about your cold. My husband first got sick and I kept telling people he had a “man cold”. Well. Then I got it. Wiped me right out. So, I hope you are feeling better. Now for your recipe. Wow. I will be making this very soon. I have to get out to buy some great chocolate. Although Kristin had a great idea about being her Valentine cake. Thanks again for another fabulous recipe. So sorry for your sore throat! Winter sickness is just horrible. I am so in love with this cake. I think it may be my Valentine’s Day treat.